18 years ago, in 1996, Dragons of the North, Norwegian Einherjer’s debut album, was one of the albums that viking metal was built on, yet without ever getting the band the same recognition as many of the later entrants into the genre. In 2011 the trio re-emerged with the critically split received Norrøn album, which showed a far less accessible side to the band, causing many fans to approach the band more warily than in the past. Now their sixth full-length album Av oss, for oss has landed and there was much anticipation for which direction the band had opted for, a continuation down the bulky, almost progressive path or a return to what made them the highly influential band in the past. And Av oss, for oss indeed did away with almost all of the progressiveness and even appears simplistic at first, potentially making the first impression a little awkward and depending on the expectations potentially also somewhat disappointing. After the very moody intro “Fremad”, “Hammer i kors” plods on in a straight and simple rhythm, with Frode Glesnes’ (or Grimar) gruff voice over it and one might find it a little dry and a little bland maybe. But to write them off just based on that would be a grave mistake, because the devil (or Odin) is in the details and there are little melodies and touches that reveal themselves, if you pay closer attention and suddenly make this album far more than just another bland viking metal album. 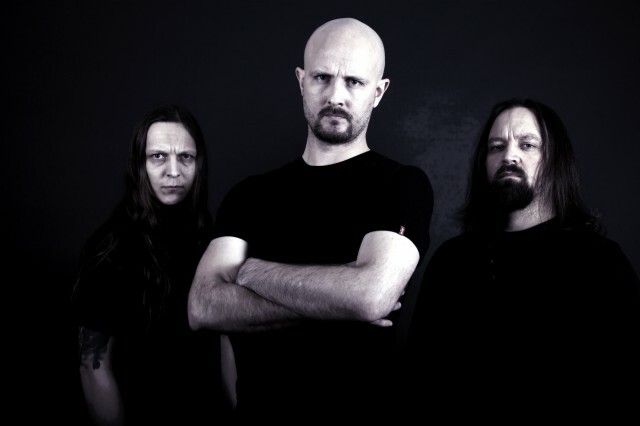 And if you think that an almost fully straight plodding track is boring or can’t get you moving, “Nidstong” is the maybe simplest song overall, but very efficient, just like “Hedensk oppstandelse”, which is one of the prime examples of these little viking metal melodies and chants sneaking in and really helping the songs forward. And this shows the experience these three gentlemen have, they do not need any flashy elements or folk instruments to get their songs to work. But there is one more… The title track “Av oss, for oss”… At over 10 minutes of playing time, it evokes images of the bulkiness of “Norrøn Kraft”, but instead it is the overall maybe most epic and atmospheric song Einherjer have ever written. Moving between epic slowness and mid-tempo, it lets many instrumental passages breathe and exude this dark and epic atmosphere that permeates the song, a grand atmosphere and a grand song that is a more than worthy ending to Av oss, for oss! There are no superfluous elements or passages on Av oss, for oss, instead it shows a battle-hardened band of veterans that know exactly what they need to do to make a song efficient, striking the right balance between heaviness and atmosphere, with great melodies, some of which are obvious, some less so. If you give the album just a little more attention than usual, it will reveal itself as an outstanding viking metal album that will not dazzle you with its flashiness, but inevitably draw you in deeper and deeper. Great work. 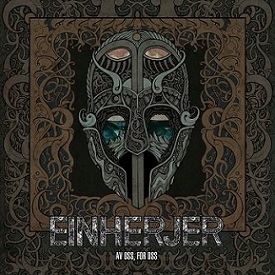 This entry was posted in Featured Review, Reviews and tagged 2014, 9, einherjer, Indie Recordings, norway, viking metal.